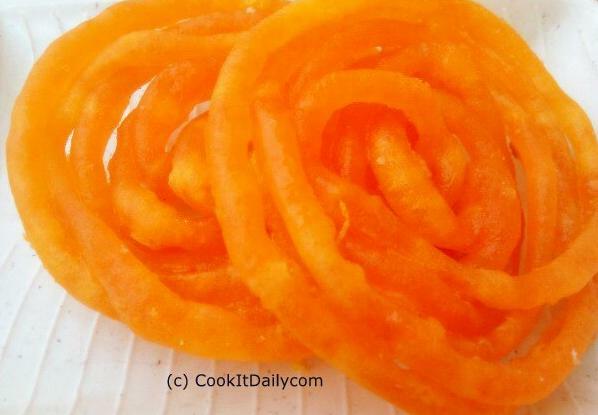 Jalebi- Sweet of Celebration – Cook It Daily! Mix the maida, besan, sooji in a glass bowl. Add baking powder, yogurt, a teaspoon of ghee and make a fine thick batter. Add the food color, mix the batter well to avoid lumps. Leave it 1-2 hours to ferment. While waiting, make sugar syrup. For this, heat up the water in a pan to the boiling point and add suger, stir it continuously, and add cardamom powder and saffron strands. Make a sugar syrup of two stings. Heat up the Oil in a deep frying pan. Take a thick cotton cloth, and make a small button hole. Fill in the batter in the cloth and use this to press out the batter in a continuous stream in the hot oil, and make circular, whirl shaped jalebi- Move from outside to the center of Jalebi. Deep fry the Jalebi on both sides till it turned golden (NOT Brown!) and become crispy. Take out the Jalebi on a kitchen tissue to remove excess oil/ghee and immediatly soak into the ready warm sugar syrup. Once jalebi has soaked the sugar syrup, it is ready to serve. Serve the Jalebi hot as ready to eat. Take a piece or two of hot jalebi, pour a spoon or two of Yogurt, and have it- the sweet and saur taste feels so yummy that you can’t stop eating more. Enjoy Jalebi- A sweet of celebration!